Anyone who’s ever had the pleasure of visiting St. Barths leaves with the same thought- “We need to come back.” At WIMCO, our clients always return from their St. Barths’ villa vacations with amazing stories, like M.T., whose St. Barths’ villa vacation included long days lounging in the Caribbean sand, and visits from a few four-legged friends. M.T. found her paradise in St. Barths’ Villa WV AIA. Where will you find yours? “We have visited St. Barth four times over the past ten years or so. It is amazing how much does not change, and what does change is usually for the better; the roads for one! Villa AIA was quite nice; nicely appointed, and well-built with nice views. Our maid did a great job every day. We had a friendly turtle, rabbit, and cat that visited us every afternoon who seemed to know each other quite well! We were happy to arrive to a stocked refrigerator, especially after a stressful transfer from St. Martin. The pool was lovely, and it worked well to cool us off after playing tennis. It is so refreshing to jump in, tennis clothes and all. 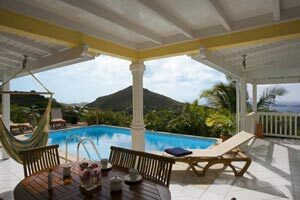 Create your own Caribbean memories; your St. Barths villa vacation is just a click away at WIMCO.